A French connection to kolams! Chantal has also written two books in French — one on Kalamezhuthu and Voyage Dans l’Imaginaire Indien, which is about kolams and the stories and sentiments attached to it. 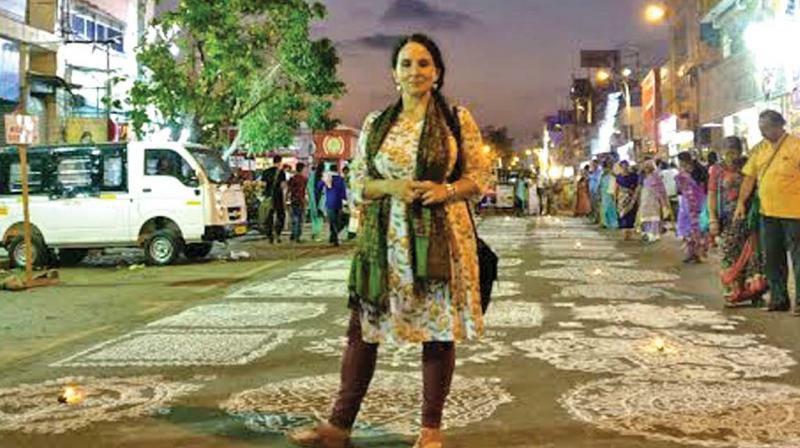 “Once, a woman told me that making chikku kolams (where twisted patterns go around the dots) will lead to many complications in the household. But there was another person who said if we are gifted to do these intricate kolams, we will also be able to face the hardships in life. Such interesting stories have been documented in this book.” Apart from this, the book also talks about festivals like Pongal, and how flora and fauna is incorporated in the kolam art. She brims with excitement when we ask her about the kolam scene in Chennai during Margazhi. “In Mylapore, I find women of the household making large ones. Just yesterday, I spoke to someone who told me that she starts working on her kolam right from the night before to complete it in the early morning! After each visit here, I think I have seen it all, but every time, there is a new discovery,” says Chantal, who humorously admits that she hasn’t had the courage to participate in the kolam contests herself. To Chantal, visiting Chennai is like homecoming. “I really can’t say what I take away from Chennai. I feel like I’m both French and Indian. Every time I’m here, I experience a mix of generosity and kindness. There are people here who take time to share precious things about their tradition and culture, I’m left with want of words” she says as a concluding note.